I think it’s no secret at this point that I love dark chocolate. It’s my biggest vice. I don’t hide it. One of the great things about dark chocolate is that a little goes a long way. You don’t need a huge serving to satisfy. When I create chocolate recipes I often choose to use unsweetened chocolate so I can control the kind and amount of sweetener I use. I often give a range because some of us like our dark chocolate quite bittersweet, and others prefer it a little sweeter. Eat it how you enjoy it most. After all, it’s meant to be a treat. 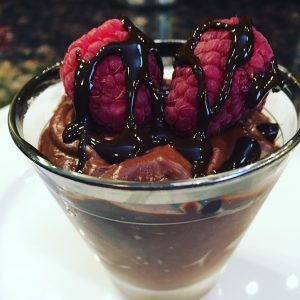 How Do You Make Mousse Without Dairy? There are a couple different options. In this recipe I kept it simple using avocado, a healthy fat that gives a creamy texture that whips well. I also use coconut milk, which whips great, adding a fluffier texture than other non-dairy milks. Those two combined create a creamy fluffiness that I won’t say is the same as egg whites, but I will say, is quite tasty and addictive! Melt chocolate on low heat. Let cool to room temp. Whip full fat coconut milk in blender or food processor. Reserve one cup. Add all ingredients except chocolate and blend until smooth, fluffy, and creamy. Scrape down sides and add chocolate as rest of ingredients blend until fluffy and creamy. Dish into serving cups and refrigerate until chilled (1-2 hours) and serve. Makes 8 two-ounce serving cups. 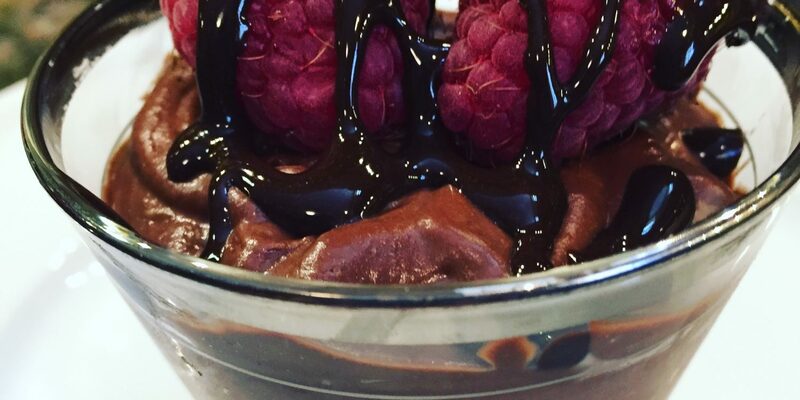 You can finish your mousse cups with raspberries and a drizzle of vegan fudge sauce. Why stop at mousse? Take it over the top!